Looking for a car that can hold up to your summer road trip plans? Consider the 2018 Honda Accord Hybrid, a luxurious, spacious, and fuel-efficient vehicle. It’s stylish, powerful and smart, and offers an incredible driving experience. 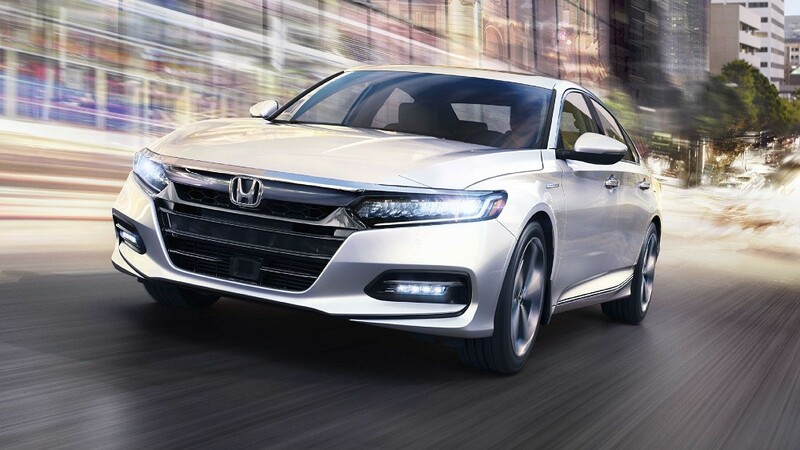 The 2018 Honda Accord Hybrid offers top-class fuel economy ratings. Under the hood sits a 2.0-litre, 16-valve, Atkinson cycle DOHC, i-VTECH 4-cylinder engine. The engine offers an impressive combined total horsepower of 212 @ 6200 RPM, offering you the power and versatility you want on any long drive. When driving the 2018 Honda Accord, drivers have more control than ever over their driving experience. For drivers who want a more dynamic driving experience, simply engaged the Sport Drive button to apply more dynamic handling. When the EV button is engaged, the Accord Hybrid switches over to a fully electric drive, and with the ECON button drivers can choose to ensure that their Accord Hybrid conserves as much fuel as possible – perfect keeping the cost of fuel down for long road trips. In the 2018 Accord Hybrid, there is room for everyone and everything. The 60/40 split fold-down rear seat offers serious cargo space and convenience to haul everything you might need for your vacation. The heated front seats keep everyone warm for cooler nighttime driving, with heated rear seats as an optional feature as well. Keeping you cool throughout the warmer weather is the ventilated front seat, an optional feature on the 2018 model. Don’t worry about overheating before you get to your destination ever again. For more information on the 2018 Accord Hybrid, visit Henley Honda today!